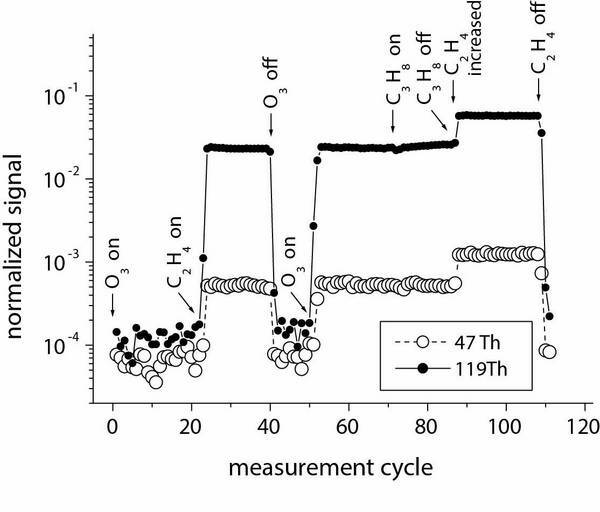 Mechanistic and kinetic investigations in the laboratory are carried out in the field of atmospherically relevant gas-phase reactions of Criegee Intermediates (CIs). Reactions of CIs are still a hot topic in atmospheric research. Experiments are undertaken in order to characterize the main loss processes of CIs via unimolecular decomposition and the reaction with water vapour. The findings will help to access the steady-state concentrations of CIs in the atmosphere and their potential role for the oxidation of SO2, organic acids and other compounds. The investigations are tightly connected with the further development of mass spectrometric detection techniques for reactive intermediates and closed-shell products with high sensitivity. Findings of recent investigations describe the first determination of the rate coefficient of the unimolecular reaction of CH2OO at room temperature (Berndt et al. 2015) and the direct detection of the simplest Criegee intermediate CH2OO (Berndt et al. 2017). Direct detection of CH2OO by chemical ionization mass spectrometry. Measured ion traces at the nominal mass of 47 Th, (CH2OO)H+, and at 119 Th, (CH2OO)(THF)H+, as a function of different reactant conditions. A measurement cycle comprises 60 s signal accumulation. Product ionization is carried out by protonated tetrahydrofuran (THF)H+. Reactant concentrations are [O3] = 6.6 x 10E11; [C2H4] = 1.0 or 4.6 x 1014; [C3H8] = 8.6 x 10E16 molecules cm-3. 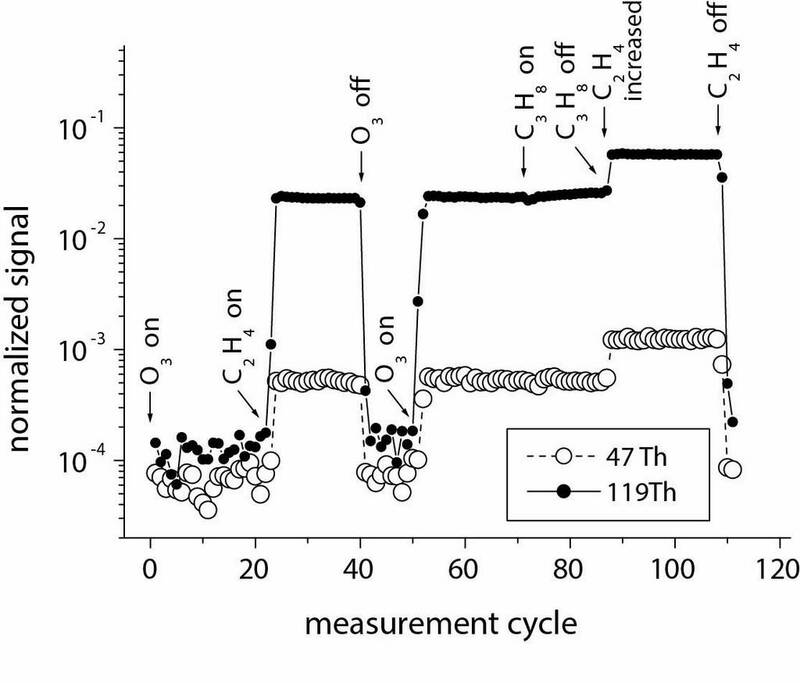 The reaction time is 7.9 s.
Berndt T., Kaethner R., Voigtländer J., Stratmann F., Pfeifle M., Reichle P., Sipilä M., Kulmala M., Olzmann M. (2015) Kinetics of the unimolecular reaction of CH2OO and the bimolecular reactions with the water monomer, acetaldehyde and acetone under atmospheric conditions. Physical Chemistry Chemical Physics 17 (30), 19862-19873, doi: 10.1039/C5CP02224J. Berndt T., Herrmann H., Kurten T. (2017) Direct probing of Criegee intermediates from gas-phase ozonolysis using chemical ionization mass spectrometry. Journal of the American Chemical Society 139, 13387-13392, doi: 10.1021/jacs.7b05849.